Last week the FBI conducted it's second auction for the assets they seized from the "Silk Road" and "Dread Pirate Roberts." 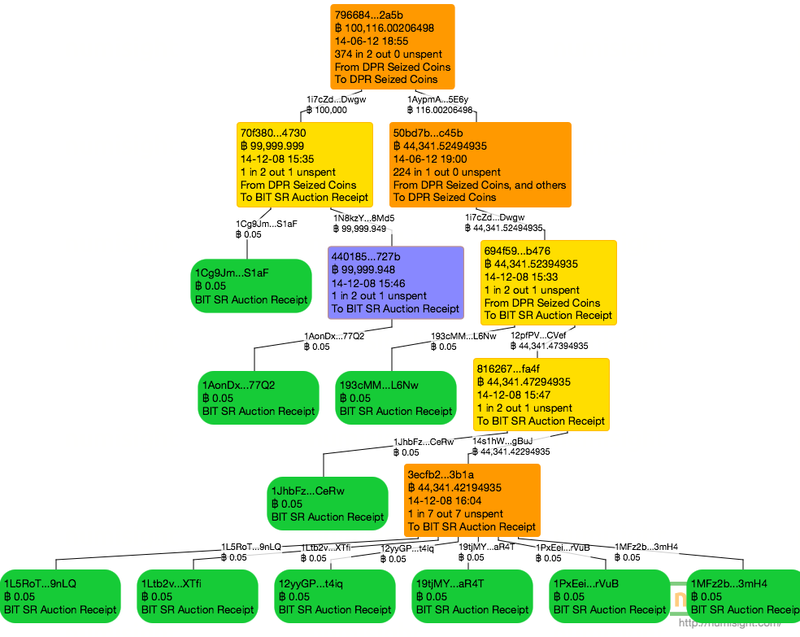 The first auction was for approximately 26,000 bitcoins in June. This auction was for 50,000 BTC. This leaves 94,000 BTC to be auctioned off, likely in two more auctions. This analysis was performed when the blockchain was approximately 334040 blocks high, so coins spent after that block will appear as green circles representing unspent outputs or "coins" as I call them. 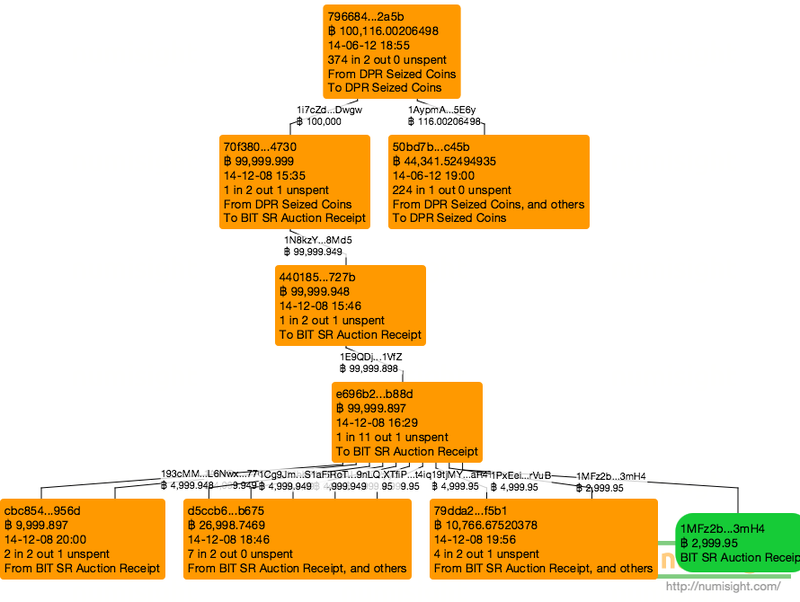 The orange and yellow blocks are transactions, and the coins are the lines between the transactions, with earlier transactions above latter transactions, hence the tope end of the line is the output and the bottom part is the input. According to Forbes, the bitcoins seized from the "Dread Pirate Roberts" were spent to the address 1FfmbH...ppPH and were later moved to 1i7cZd...Dwgw. This move was co-incident with the first silk road auction. One coin held 100,000 BTC and the next over 44,000 BTC. On the 9th of December the Bitcoin Investment Trust announced via twitter that they won 48,000 BTC in the auction. This announcement was made after they had received the coins from the FBI. On the day before the twitter announcement the presumed FBI stash started seeing a number of transactions consistent with this claim, so it will be presumed in this analysis that those coins went to the Bitcoin Investment Trust (BIT). The first transactions consisted of a series of "Bit Nickel" (0.05 BTC) transactions to address that would later hold larger value coins. This occurred from blocks #333429 to #333433. It is interesting to note that these test transactions came from both the $100k coin and the $44k coin from the June transactions concurrent with the first auction, not the transactions resulting from one of those stashed coins. After those transactions were seen on the blockchian and presumably confirmed by the BIT the FBI then sent the balance of the sale in a single translation on block #33435. 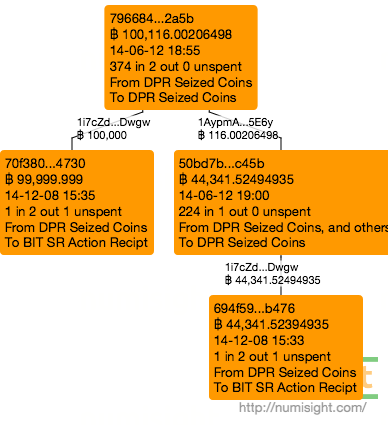 While it might be tempting to presume that the BIT controlled each of the paid out coins and did whatever the felt was appropriate the grouping of the transactions indicates to me they had some fiduciary duties they were fulfilling since each transaction below the initial payout tells a different story. First let's look at the leftmost transaction. 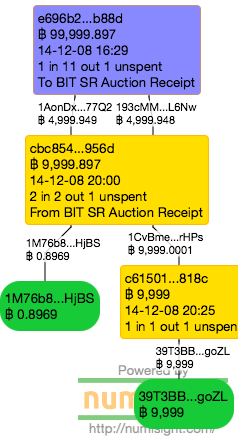 This chain tells a very simple story of a small payout to 1M76b6...HjBS (which is a single use address at the moment), and then a movement into a p2sh address 39T3BB...goZL for the remainder. The 39T3 address was topped off with another BTC from another thread that I presume to be sourced from the BIT, since that chain also fed the address we see in the second set of transactions. Apart from a relatively small payout of about 147 BTC this group creates a very nice peel chain into the p2sh address 3LzDzK...7TJc. This address has some significant holdings, with just under half of it coming from transactions not originating from this peel chain. Presumably this is BIT cold storage, but I have nothing to pin that on other than intuition. Finally the right two transactions tell yet a third story. First, we see that one of the auction coins has yet to be spent after about a week. 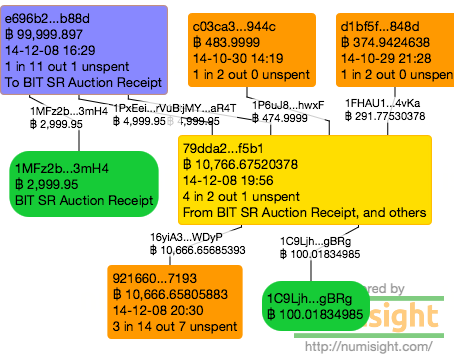 The other 10K of coins went into a small (by this auction's standard) payout of 100 BTC and then the remainder went into a fairly complex series of transactions that this blog post won't go into. Presumably it was the machinations of the BIT hot wallet, but it could have just as easily been a client putting their balance into a bitcoin mixer. I have no way to tell on this one. According to Coin Telegraph Tim Draper won the remaining 2000 BTC in this auction. We can see transactions consistent with this claim in transactions closely related to the BIT transactions. This payout occurring after the transfers to the Bitcoin Investment Trust, so this also would bit the narrative that BIT's blocks were the highest bid blocks and were thus completely dispersed first. 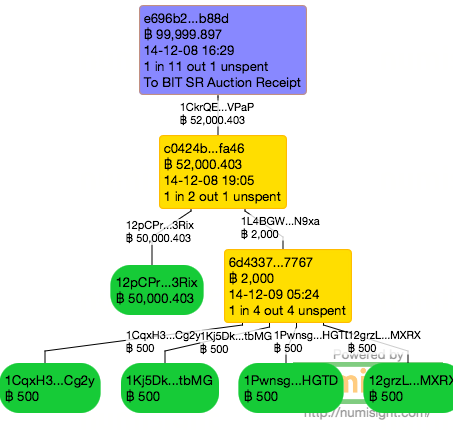 Unlike the top bidder's sale the transaction went straight to a single address with no test transactions. Perhaps BIT included that provision in their winning bid. Howeve things worked out well for Tim Draper in the first auction without a test transaction and his proceeds represent less than a tenth of what he received last time. Within a day the coin was the split into four bundles of 500 BTC a piece, ready for cold storage. This would have been 9:30 in the evening Silicon Valley time, so it could have been a transaction set up later in the day on the west coast. These were single signature addresses as opposed to the (presumably) multi-sig addresses BIT used. We shouldn't presume that these don't have multi-factor protections, it is just that those protections are not evident on the blockchain. It is really interesting to be able to plow through the bitcoin transaction logs and identify the events that are being reported in major news outlets. That is what I see as one of the greatest strengths of the blockchain: a publicly auditable record. If only we could get some of those too-big-to-fail banks on a blockchain style ledger. It might make it harder for management to shrug their shoulders and claim ignorance for what their rouge traders are doing. Finally, I would like to apologize for the lack of updates. Between my day job, a major conference, and several important family events my todo list ran much longer than my time and energy available. But like a trail of breadcrumbs that the birds might eat, the trail will come in a very irregular schedule.